Rothco's Polyester Paracord has many of the same great attributes of commercial nylon paracord, plus additional features that just may make you consider using 100% polyester paracord in your next parachute cord craft project. Similar to nylon paracord, the polyester paracord includes an inner core of 7 twisted strands. Polyester paracord has the same diameter at approximate 5/32 of an inch as does 550 Type III paracord. In addition, just like the nylon paracord, the cut ends of the polyester paracord can be melted. The differences between nylon and polyester paracord are that the polyester paracord has a test strength of 727 LBS, and the polyester paracord is made in China, meaning the price is a little lower then the US made nylon paracord. 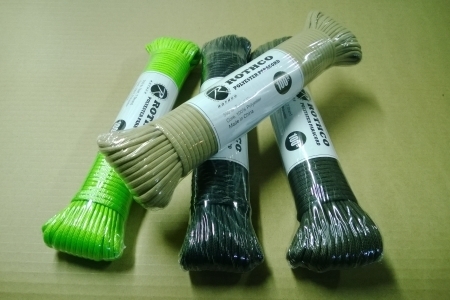 One additional difference is that people have often commented that the polyester finished product seems less stiff and bends around wrist/necks more comfortably than items made from nylon paracord. Rothco's 100 feet of ACU Digital 100% Polyester Paracord features an inner core of 7 twisted strands, giving it a test strength of 727 lbs. At approx. 5/32 of an inch it is the same diameter as 550 Type III nylon paracord. Rothco's 50 feet of Black 100% Polyester Paracord features an inner core of 7 twisted strands, giving it a test strength of 727 lbs. At approx. 5/32 of an inch it is the same diameter as 550 Type III nylon paracord. Rothco's 100 feet of Black Reflective 100% Polyester Paracord features an inner core of 7 twisted strands, giving it a test strength of 727 lbs. At approx. 5/32 of an inch it is the same diameter as 550 Type III nylon paracord. Rothco's 100 feet of Camo 100% Polyester Paracord features an inner core of 7 twisted strands, giving it a test strength of 727 lbs. At approx. 5/32 of an inch it is the same diameter as 550 Type III nylon paracord. Rothco's 50 feet of Camo 100% Polyester Paracord features an inner core of 7 twisted strands, giving it a test strength of 727 lbs. At approx. 5/32 of an inch it is the same diameter as 550 Type III nylon paracord. Rothco's 100 feet of Charcoal Grey 100% Polyester Paracord features an inner core of 7 twisted strands, giving it a test strength of 727 lbs. At approx. 5/32 of an inch it is the same diameter as 550 Type III nylon paracord. Rothco's 100 feet of Desert Camo 100% Polyester Paracord features an inner core of 7 twisted strands, giving it a test strength of 727 lbs. At approx. 5/32 of an inch it is the same diameter as 550 Type III nylon paracord. Rothco's 50 feet of Desert Camo 100% Polyester Paracord features an inner core of 7 twisted strands, giving it a test strength of 727 lbs. At approx. 5/32 of an inch it is the same diameter as 550 Type III nylon paracord. 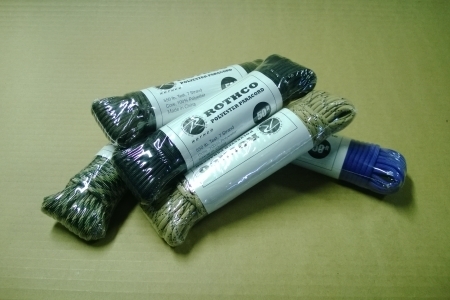 Rothco's 100 feet of Olive Drab 100% Polyester Paracord features an inner core of 7 twisted strands, giving it a test strength of 727 lbs. At approx. 5/32 of an inch it is the same diameter as 550 Type III nylon paracord. Rothco's 50 feet of Olive Drab 100% Polyester Paracord features an inner core of 7 twisted strands, giving it a test strength of 727 lbs. At approx. 5/32 of an inch it is the same diameter as 550 Type III nylon paracord. Rothco's 100 feet of Safety Red 100% Polyester Paracord features an inner core of 7 twisted strands, giving it a test strength of 727 lbs. At approx. 5/32 of an inch it is the same diameter as 550 Type III nylon paracord. Rothco's 100 feet of Rose Pink 100% Polyester Paracord features an inner core of 7 twisted strands, giving it a test strength of 727 lbs. At approx. 5/32 of an inch it is the same diameter as 550 Type III nylon paracord. Rothco's 100 feet of Royal Blue 100% Polyester Paracord features an inner core of 7 twisted strands, giving it a test strength of 727 lbs. At approx. 5/32 of an inch it is the same diameter as 550 Type III nylon paracord.